The rising standard of living and the increasing demand for comfortable lighting worldwide are driving the concept of ambient lighting. Ambient lighting helps in creating engaging environment by adding dynamic lights and projections to bring comfort to users. It is responsible for radiating the illumination effect according to the mood of the users. The ambience created by this lighting system is widely in demand among the hospitality, residential, and retail industries. To bring the effect of ambient lighting, multiple light sources, such as LEDs, halogens, and fluorescents, are used. 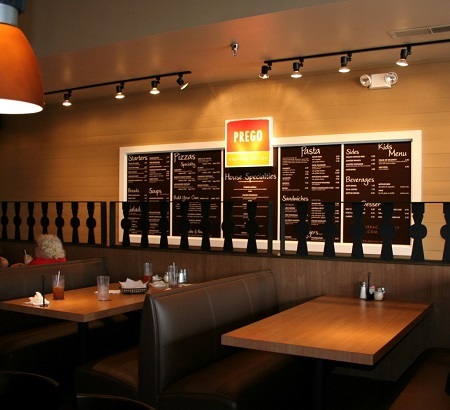 Also, multiple light fixtures, such as suspended, recessed, surface mounted, track, and strip lights, are widely used in the commercial sector, industrial, and residential sectors. According to the American Lighting Association, a good lighting plan requires the use of a central source of ambient light in rooms to get an ambient lighting effect. Philips Lighting Holding B.V. (Netherlands): The company offers an extensive array of lighting solutions for the residential, commercial, and public sectors. It operates through five major segments: Lamps, LED, Professional, Home, and Others. 2. General Electric Company (US): The company manufactures and sells a variety of energy-efficient solutions for use in commercial, industrial, municipal, and residential applications worldwide. Its solutions are integrated with LED, fluorescent, halogen, and HID technologies. 3. OSRAM Licht AG (Germany): The company operates through its Specialty Lighting, Opto Semiconductors, Lighting Solutions and Systems, and Lamps segments. It also provides lighting solutions and specialty products featuring energy-saving technologies. 4. Acuity Brands Lighting, Inc. (US): The company offers conventional lighting solutions and connected lighting control technology for consumer, industrial, and decorative lighting applications. Its key offerings include devices such as luminaires, lighting controls, lighting components, power supplies, and integrated lighting systems for indoor and outdoor applications. 5. Cree, Inc. (US): The company develops and manufactures lighting-class LED products, lighting products, and semiconductors for Use in power and radio-frequency applications. It provides products for indoor and outdoor lighting, video displays, transportation, electronic signs and signals, power supplies, inverters, and wireless systems. Several new players are entering the ambient lighting market. Some of the key innovators in the ambient lighting market are Ketra (US), Iluminarc (US), TAO Light (China), Nualight limited (Ireland), and Lafit lighting (India). LED lamps comprise a major segment of the ambient lighting market. LED lamps are expected to offer more complex solutions, ensuring comfort, security, and flexibility to end users. • The presence of major lighting players and the increasing population in APAC are contributing to the growth of the ambient lighting market in this region. A significant share of the population in this region prefers cool colours effects (cool colours are the hues from blue green) in their ambient lighting systems. 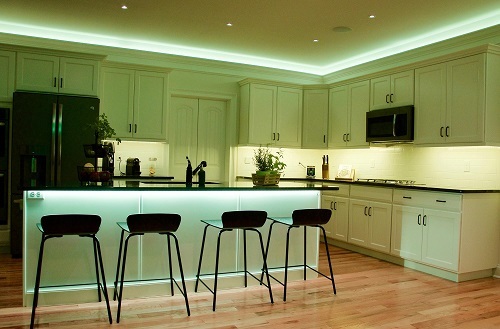 The rising demand for interior designing has boosted the demand for ambient lighting in the residential sector. • The ambient lighting market in Europe is expected to mature first, owing to high standard of living of the people in this region. The hospitality and retail sectors in this region are expected to contribute to the growth of the ambient lighting market in this region in the coming years. Consumers in this region prefer warm colours (warm colours are hues from red) to cool colours. • In North America, the regulatory ban on incandescent light sources is boosting the demand for LEDs for use in ambient lighting. Extensive research and development is being carried out to implement automatic controlling unit mechanism in ambient lighting systems in North America. Acuity Brand Lighting Inc., Cree, Inc., and Hubbell Inc. are some of the major companies that offer ambient lighting solutions in this region. 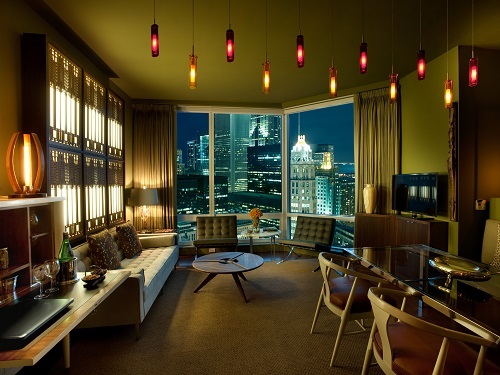 • In the Middle East, the hospitality industry is focusing more on replacing traditional lighting systems with ambient lighting systems owing to the benefits offered by them, such as better comfort, energy-efficient sources, and improved controllability of the lighting systems. The rising focus toward adjusting lights in various spaces according to the mood of users is further boosting the demand for ambient lights in this region. • APAC holds the largest share of the ambient lighting market, and this trend is expected to continue between 2017 and 2023. • On the basis of end-user applications, the ambient lighting market for the hospitality and retail sectors (Including hotels, restaurants, cafés, retail shops, and supermarkets) is likely to grow at the highest rate between 2017 and 2023; and the residential sector is expected to hold the largest share (in terms of revenue) of the market by 2023. • Among various light fixtures, the market for recessed and surface-mounted luminaires is expected to grow at a high rate owing to their wide application and presence in the residential and commercial sectors. Further advancements in products related to ambient lighting include maximising cost savings and enhancing the competence of the products. 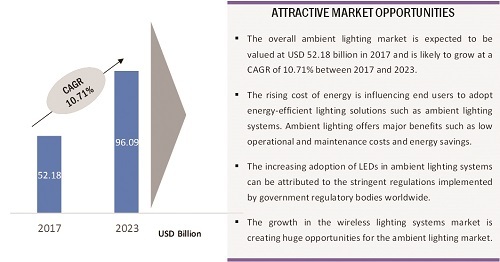 • Smart lighting systems, including automation and connected lighting, is expected to create huge growth opportunities for the players in the ambient lighting market. • The demand for LED strip lighting for use in vehicles is increasing. The ambient lighting in vehicles ensures comfort and safety of drivers, along with the presence of comfortable illumination inside the vehicles. LED lamps offer comfortable and soothing illumination effect. The rising demand for energy-efficient lighting systems and the phasing out of incandescent lamps are increasing the awareness about and the usage of LED lamps in various applications. The implementation of control units and automation in LED lighting units makes ambient lighting simpler and more efficient. The LED luminaires of companies such as GE Lighting are backed by intelligent lighting control systems that are capable of delivering massive savings on energy costs. These products not only improve the look and feel of the space but also help create a positive corporate image using their outstanding aesthetics. The increasing competition among the companies to offer the latest technology-based products in the ambient lighting market is increasing their focus on R&D. The increasing need for energy-efficient lighting solutions and the rising number of lighting companies entering the market are contributing to the growth of the ambient lighting market. The phasing out of incandescent lamps from various applications in countries such as the US, the UK, Mexico, and Germany is driving the growth of the ambient lighting market for LED lamps. Ambient lighting systems are expected to be the combination of automation and controllable units in the near future; this would lead to the easy installation of complex lighting units and would ensure improved safety and comfort to users. However, a significant amount of the market revenue will be generated from the hospitality and retail sectors owing to the fact that these sectors are closely related to customer comfort.